This Christmas I made journals for our boys. I had seen an idea in a magazine about writing notes back and forth to eachother and placing them in their own mailboxes. I liked the idea but didn’t want the space of mailboxes sitting in the house. 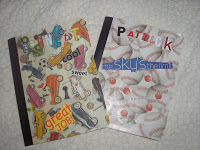 I had made a journal in a craft at MOPS (Mothers of Preschoolers http://www.mops.org/) and realized I could do that for the boys. So, I went to Michaels and found some great scrapbook paper and mod podge and then to Target and bought 2 plain Composition Notebooks. I also cut out words and phrases from magazines according to their personalities. I wrote to the boys first, explaining that this was a way to communicate with anyone in the family by writing or drawing a picture and then placing the journal on their pillow. Then the person can write back and place it on their pillow. The boys were very curious about this process and so far we have exchanged 3 or 4 notes. Some have been pictures of cars drawn by the boys, others have been notes of appreciation from me for helping out with something. I look forward to filling up these books and making new ones and then years from now, getting them out and going through them with the boys.